While buzz around self-driving cars proliferates, automotive technology is gaining immense traction. Presently, self-driving innovation has not exceeded level 2 of autonomy (out of 5) with features such as backup cameras, autopilot and assisted parking. To reach level 5, the industry needs to utilize real-time absolute localization and scale critical requirements. First, a vehicle must know its location down to the centimeter. Secondly, self-driving vehicles must be able to acquire satellite signals within seconds to safely navigate. Lastly, autonomous vehicles will soon be the rule of the road, not the exception. Precise positioning solutions must scale to cover large geographical areas and millions of users. Identifying the immense potential of precision navigation, Swift Navigation—a San Francisco-based company—is empowering the future of autonomous vehicles with accurate and affordable GPS positioning technology. While Swift’s products are significantly lower-priced than its competitors, the tech firm’s GNSS solutions are proving to be as accurate as legacy receivers costing 10x more. Having started as a hardware company, Swift recently began offering an Internet-delivered Global Navigation Satellite Systems (GNSS) correction service called Skylark™. Swift’s flagship product Piksi® Multi is a centimeter-accurate multi-band GNSS receiver. Access to multiple frequency bands and multiple satellites endows autonomous systems with greater accuracy and reliability. “With Piksi Multi, one can receive data from dozens of satellites. More satellites means a higher fidelity navigation solution,” said Fergus Noble, Co-Founder and CTO of Swift Navigation. Complimenting Piksi Multi is its tough and durable version, Duro®—a Piksi Multi GNSS receiver housed in a cast aluminum enclosure. This rugged product is IP67-rated, allowing it to be used in harsh outdoor environments. Duro is water resistant, can withstand extreme temperatures, vibration, and dust. “Duro does not need to be embedded inside an autonomous vehicle, instead, it can be easily mounted on top of it,” Noble added. To broaden its service offering, Swift delved into cloud correction services and built Skylark, which works with Piksi Multi and Duro receivers. Skylark provides high-precision GNSS navigation corrections to autonomous vehicles via Internet connectivity. Skylark is unlike other services that require radio antennas or leave users tethered to base stations allowing only about 20 miles of range. Instead, Skylark operates like a utility service. Vehicles can travel vast distances by continuously connecting to the Skylark cloud. Swift has gained a reputation for affordable precision GNSS and has 2,500 customers across the globe. Those interested can easily start by visiting Swift’s online store where they can order Swift receivers and sign up for a monthly or annual corrections service plan. Swift has made it easy to get started by developing Evaluation Kits that contain all components necessary for a successful assessment of Swift’s GNSS technology. A Swift Navigation client, Voyage—a self-driving private taxi service provider that caters to communities across North America—uses both Skylark and Piksi Multi in its real-world application. 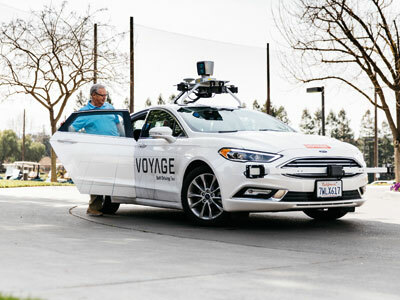 Equipped with a roof-racked suite of sensors including Piksi Multi, LiDAR, cameras, radar, and an IMU, Voyage’s fleet of taxis have autonomous steering control, braking and other functions. Voyage serves a community of 400 residents spanning a 15-mile road network.